Simple, delicious, and your oven can do the work for you while you relax or do other things. 1 roaster chicken, about 7 lbs. Preheat oven to 350 degrees. 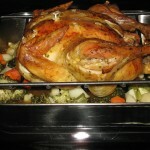 Rinse, pat dry, and place chicken on rack in roasting pan. Place all of the garlic into the chicken cavity, squeeze the lemons over the chicken and stuff some inside cavity too, others toss around chicken pan, add all seasonings onto the chicken, rub them in then pour broth into pan. 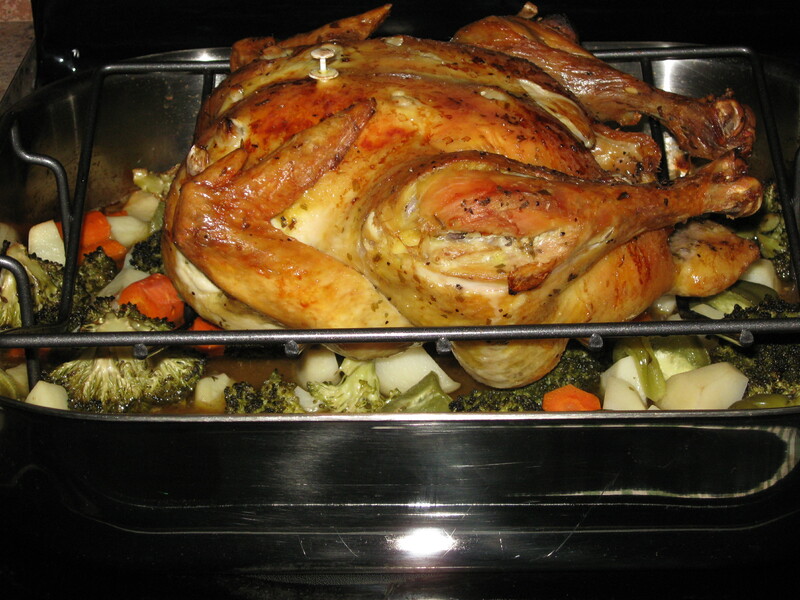 Cover with foil, bake chicken for 1 hour, add all the veggies to the pan with another 1 cup broth and bake until cooked through – takes about another 60 – 90 minutes, but test using a thermometer. Occasionally check to make sure it is not too dry; if it is add another 1/2 – 1 cup broth in and around. Take cover off the last 15 minutes or so to let brown.